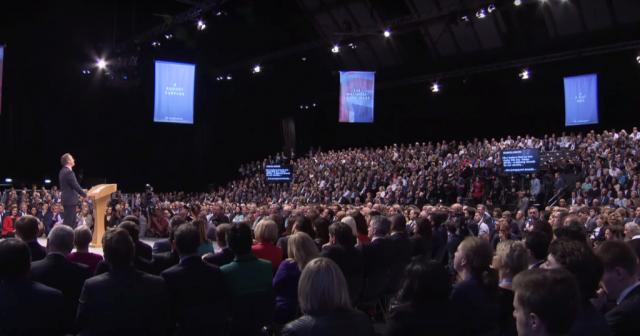 David Cameron gave a confident, upbeat, often passionate address to the Conservative Party conference in Manchester. There were jokes galore – on his feelings towards Ed Balls and even his recent run in with Michael Ashcroft. There was so much laughter that you’d be forgiven for thinking it drowned out the important details. But the truth is, those important bits remained largely unspoken. Cameron reiterated his commitment to “one nation” Conservatism and outlined quite a radical social agenda, but he is more moderate than most of his party. This has been an asset for him with voters but he has learned to keep it light in front of his own people. The huge hurdle he faces over the EU is a particularly difficult matter, but there is also a question on everyone’s lips but his – who will succeed him. Cameron did clearly say that he will stand down as leader ahead of the next election and he gave some clues as to who he thinks should, or could, succeed him. George Osborne was name checked as the “iron chancellor” and is said to be the PM’s pick. However, Cameron also invited the audience to give Boris Johnson a standing ovation. That said, he followed this with remarks about Johnson being the “tighthead prop” that may have implied that he thought Boris lacked the necessary gravitas. Theresa May had tried to stake out her claim with a tough speech on immigration ahead of Cameron’s appearance but that did not go down well outside the party. Nor did it earn her a special name check in Cameron’s speech like those enjoyed by her two rivals. And there was no word at all about the dark horse, Nicky Morgan, who seems to be gearing up to put her name into the pot. Much will depend on how Cameron leaves office. If he is forced to resign after a defeat in the referendum on EU membership, that could harm Osborne and help Johnson. If he goes at a time of his own choosing in 2019, that could help candidates like Morgan to build a support base. The full picture on Europe? Having been on tour to talk to other European leaders, Cameron stated clearly that he has no romantic attachment to the European Union and its institutions. But he does think it brings benefits to the UK as a trading area and he wants to be able to influence the decisions of that trading area from the inside, rather than being like Norway, which has to lobby from the outside. He also reminded his party that he wants to secure changes through negotiations. Perhaps conscious that this is not the preferred route for many in the audience, he once again attacked the notion of an “ever closer union” to great applause. That could be a relatively easy win though because it has never had much practical effect on how the EU operates. Other major British objectives may be difficult to achieve. Cameron could be left with a series of changes which opponents of British membership may feel able to describe as “cosmetic”. That could make it harder for him to keep Britain in the EU. Cameron indulged himself throughout his speech by repeatedly revisiting an election victory which the pundits thought he could not achieve. Indeed, he revealed that his boxes had been half packed at number 10. And there were many jibes at Labour. These went down very well in the hall but his criticisms of “security-threatening, terrorist-sympathising, Britain-hating” Jeremy Corbyn were predictable. Cameron, after all, may attest his love for his country but that country is at risk not just from the causes he claims Corbyn supports but from division if England votes to leave the EU and Scotland votes to remain. However, the most important part of the speech came at the end. Cameron reiterated his commitment to diversity and tackled such difficult issues as social mobility and penal reform. It is significant that he used the phrase “we, the state” when pledging to address inequality. That’s a term that doesn’t come easily to a Conservative and suggests that he continues to believe the party should occupy the centre ground. His commitment on these issues is real enough, but his critics would argue that such challenges cannot be properly tackled when public expenditure is being cut back in key areas – not least local government. Cameron talked about the living wage, but neutral analysts argue that this could be more than offset for the working poor by the cuts in tax credits, which remain controversial among some Conservative MPs. Cameron clearly knows what he wants to achieve in his last term as prime minister, but there are many obstacles in the way. Cameron: coming to the (foreign) aid of the party?